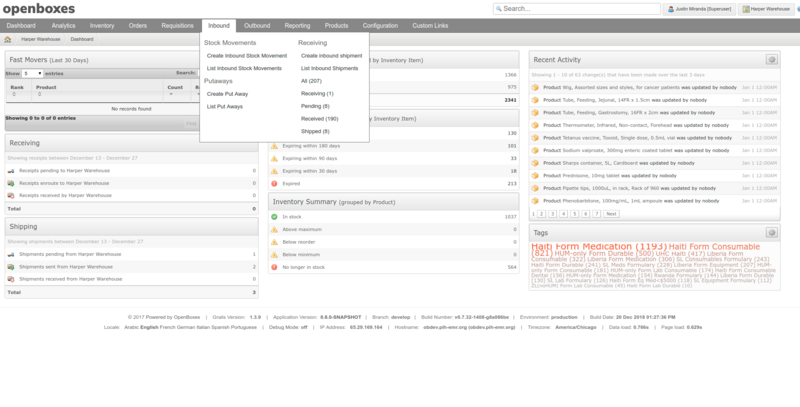 Increase stock visibility across all facilities and departments within your organization. 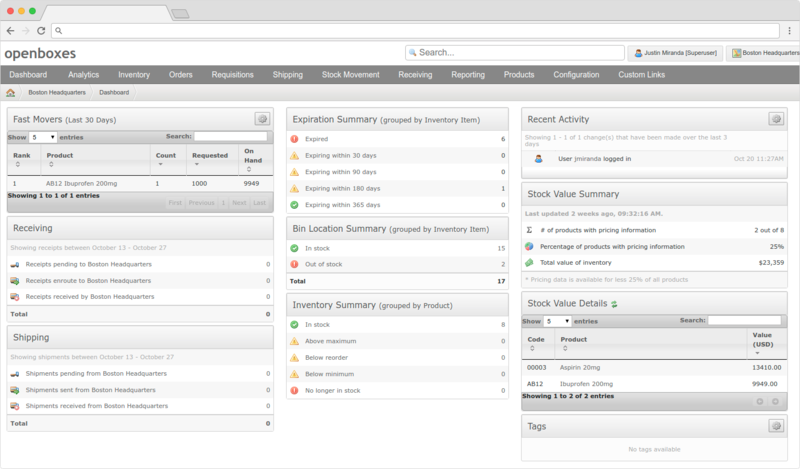 Reduce the risk of stock outs by informing users when stock levels are at or below reorder and minimum quantity. Reduce wastage through use of first-expiry-first-out (FEFO) picking strategy that ensures medicines will be used before their expiry. Improve planning and forecasting by analyzing demand data that is easily accessible. OpenBoxes is open-source which means you have access to the source code which provides the flexibility to customize the software to your requirements. Improve traceability by using data standards, including lot numbers and expiration dates, to better handle exceptional product lifecycle events like product recalls. OpenBoxes helps us to manage all products we need and understand consumption. If you have accurate consumption you will have good numbers for orders and meet the needs of patients. The more we use the system, the more you will be aligned with the philosophy of a preferential option for the poor. 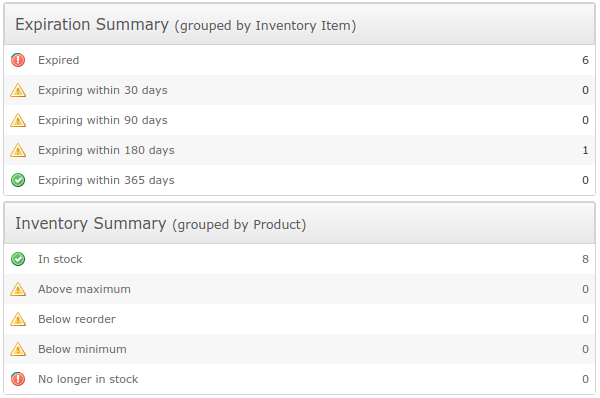 I am excited the new stock movements feature, including import and export feature, edit page, and the autopick feature. I also like the partial receipt feature. It gives you the ability to do your work much faster. I really love this version. I really love this Openboxes because it’s my first time using an electronic inventory management system. It is easy to use. It helps you to pick the medication on the shelf faster. 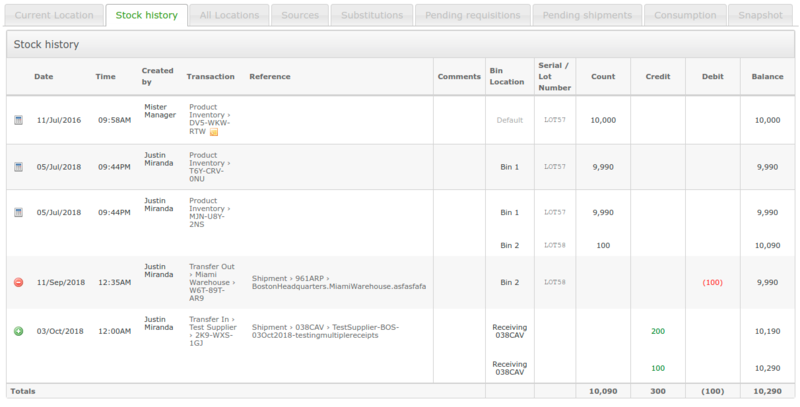 Now I know that if a partial shipment comes from Monrovia, I can receive it in the system, which is easier than before. Release Notes See full release notes Improvements If a substitute has zero quantity available, will not show up in the list of options in substitution pop-up (OBPIH-1464) In substitution pop-up, lines with earlier expiration date will appear in red for users to more easily identify these lines (OBPIH-1533) Adjust inventory pop-up now includes header with code and name of item (OBPIH-1519) Added ability to sort by bin on pick page. Release Notes See full release notes Improvements New menus: Instead of “Shipping” and “Receiving,” the top menu now shows “Inbound” and “Outbound.” If you want to see all of the shipments coming to you, go to incoming>list stock movements. For shipments you have sent, go to Outbound>list stock movements Changes to stock movement view page: The stock movement view page now has a more complete picture of the stock movement. October 2018 October 2018 is an exciting month for OpenBoxes with the implementation of Version 8. 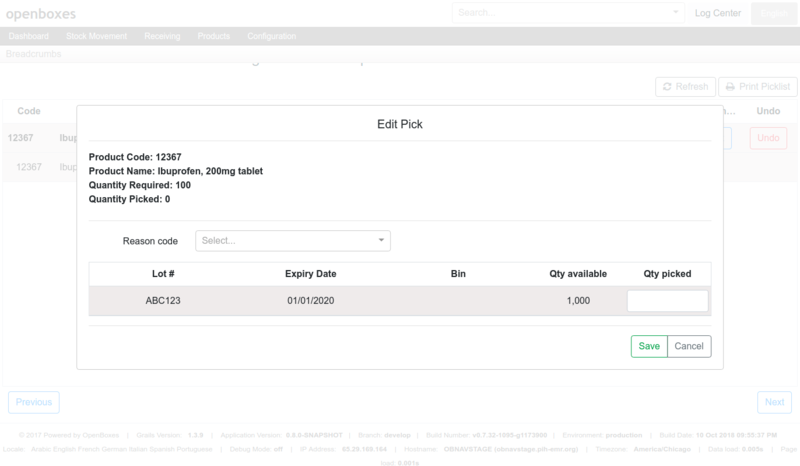 The software now features consolidated and automated workflows for all types of stock movements, the ability to partially receive a shipment, and a more flexible put away workflow. Automation includes selection of appropriate workflow for type of stock movement selected, suggested pick based on FEFO and quantity in bin, and data validation for substitutions and picking.